Senator (#116811) (1898-1934), 280-foot steel-hulled coastwise passenger cargo steamer of 2409 gross tons, powered by an 1800-horsepower reciprocating steam engine when she was launched in San Francisco in 1898. She had three decks, two masts, and could carry 187 passengers. She cruised at 10.8 knots. From her launching in 1898 until 1916, she was operated by the Pacific Coast Steamship Company. She was named for Senator George C. Perkins of the firm Goodall, Perkins & Co., which was at that time manager for the Pacific Coast Steamship Company's steamers. According to Santa Cruz Island Company records, Senator served Santa Cruz Island at least in 1911. 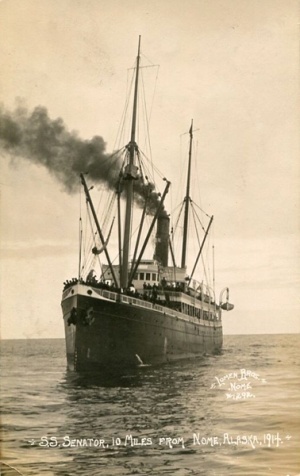 From 1916 until 1931 she was owned by the Admiral Line and renamed the Admiral Fiske. In 1934 she was sold to Japanese interests for scrap. This page was last edited on 1 July 2015, at 15:46.